As I flicked through the pages of ‘Tea and Thread’ I was instantly drawn in by the delicious food, intricate handicrafts and the striking images of women and children contained within this visually stunning book. Tea & thread takes you into the lives of middle eastern women. It shows the heartbreaking reality of life in a country ripped apart by war and persecution, the pain of waiting for resettlement in a refugee camp and stories of hardship beyond my imagining. But it is not a sad book. It is also a book full of joy and thankfulness for family, for safety and for the things these women have been able to cling to – treasured family recipes, skills passed down the generations and their faith. I was given the book ‘Tea and Thread’ for Christmas last year. It’s a book that you really do want to sit down with a cup of tea and pour over the pages. The images of women clutching onto photos of lost loved ones, of weathered hands producing intricate embroidery and of colourful ingredients used to make traditional dishes are exquisite. There are recipes to cook, instructions on how to do calligraphy, henna, Bedouin wool weaving and how to make olive oil soap to name just a few. Then when you begin to read the stories, you begin to glimpse who these women are and your heart breaks for their lives torn apart. But you also get a sense of their hospitality with the little they have. I used to work as a teacher in Lakemba and was always astounded by the middle eastern culture’s generosity. Many of the mothers of my students would regularly make me delicious home baked biscuits and honey drenched baklava. After reading right through the book, I knew straight away that I wanted my family to hear some of these women’s stories. Like that of Um Obeyeda, who had to flee Syria with her family, and now lives in Jordan with her husband and children enduring endless waiting for news of when they can emigrate. I want my kids to have compassion and love these people as Jesus does. So, a few months ago I decided I would pick a meal from the book and share the story of the woman who wrote the recipe. Now, to be clear, I was under no illusions that my children would suddenly be overwhelmed with gratitude at this new and different food that came with a story and that probably (like every other meal time), they would reject the meal put in front of them but decided the benefits to be gained were worth it. I chose a Syrian meal called Maqloube (Chicken and vegetable pilaf) written by a woman called Um Ghasan. It contained 2 different types of meat, so I knew straight away that my husband and son would be happy. I then told an abridged version of her story. My very empathetic middle child began to cry. My eldest had lots of questions, and my youngest did what she does best, complained that she didn’t like the food. But despite this, it was worth the effort. I'm hoping that this is one small step towards shaping Christ like compassion for others in my children and lifting their eyes beyond their own experiences, so that when they meet a refugee at school, church or a park, they have a small understanding of what that child might have been through. 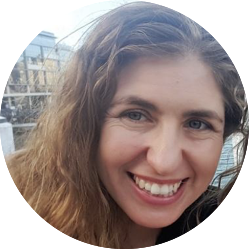 Writer | Stephanie Philpott Stephanie lives in South West Sydney with her husband who serves as an Assistant minister, and their 3 school aged children. She enjoys sleeping in, teaching the Bible to kids, and this year continues to live the dream of going to cafes kid-free!